You’ve made two records together and your individual careers are highly documented. What do you enjoy about touring besides getting to play with each other? Abigail Washburn: We love touring touring together because we love the challenge of trying to make a whole show with two banjo players. We think that’s a really cool challenge. 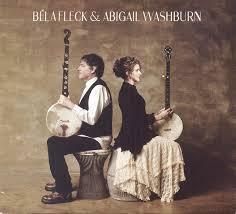 Bela Fleck: We have a singer, too, though. A: Yeah, she’s alright (jokingly). B: To paint a complete picture with just those three elements is really fun because we have to get creative and have to figure out how to complete the songs and the ideas that each other have with what we can do. A: The other reason we really love touring this music is because we get to be together as a family. We have a five, almost six-year-old, and we have a ten-month-old baby. So we are having a really good time getting to be together rather than having to tour separately as musicians. B: And also I would say that it’s really something to be in a relationship with somebody that you love and then also get to play music on stage with them and share that part of life, which is also a very intimate part of being a musician, collaborating playing music. It’s intense and special and to do that with your partner is really something. Can you speak on how you have grown as musicians over the years and how the perception of banjo has changed during that time? A: Well I think both Bela and I come in to music as curious souls and not genre specific musicians. So I think for both of us, something we share in common is this perpetual search for things that excite us musically and they don’t have to fall within a certain realm or a certain oral tradition. Although we do share a deep love for folk music from bluegrass to old-time Appalachian music and old folk songs. B: And folk music from other countries, we both dig a lot. B: There’s a banjo-centric pleasure about this thing too. I remember when I first came up, David Grisman was starting his jazz mandolin kind of project. I guess if you don’t know about it that’s the best way to describe it is kind of gypsy jazz on mandolin. And he would have two mandolins in and sometimes we would do things with lots of mandolin. We’d have mandocello and mandola and I always thought we need to do something like that with the banjo where it was just about the banjos. In a way this is also an opportunity for us to do that and do a very sort of banjo driven group. So we have banjo cellos, we have banjo ukulele, we have baritone banjos, we have bluegrass banjo, we have old time banjo, we have old-time banjo, we have gut string banjo, we got fretless banjo, we’ve got them all with us. So we’ve got a pile of instruments around us that we’re drawing from as we do the show, so that almost every song has a different set up of different instrument combinations. To make that song special and different from the other. B: So some people that have got a lot of preconceptions about banjo have sort of negative connotations based on sort of a southern white kind of part of its heritage. Bluegrass sense of a trashiness or things like this that made people be very insulting to me when I was a kid playing the banjo. I found it to be very offensive. People would start clapping their arms and going yee-haw. Deliverance didn’t help. But now what I’m seeing is that times have changed and people don’t have that same preconception. It used to be that they would not have banjo not even in country music because it didn’t make the music cool. Now rock bands are putting banjos in their group to make them cool. And that’s a big scene change for me as someone who has been at this quite a bit longer than Abby. To see banjo become an object as sort of curiosity and warmth rather than something to look down on. It really feels like it’s evolved. I remember getting in to your music in middle school and eventually reading about you in DownBeat, a jazz magazine. Additionally, I don’t think I could have shown my friends something like Goat Rodeo in the past and piqued their interest. B: It has. It has and now there’s sort of a hipness. And people are going, ‘Oh what are these guys doing with these instruments. I had no idea.’ But to say that about jazz, it’s so odd. If you mentioned banjo to people they would never think of jazz. It [would be] the last thing they would think of. And yet, banjo was in the very first jazz groups with Louis Armstrong. That was the chording instrument, not guitar. But that seemed to have been wiped away for a lot of people over the years of the power of bluegrass kind of wiped everything away in the general country’s perception of the banjo. And going back of course to the fact that it comes from Africa. That’s way beyond most people’s thoughts. But now even that is starting to become more common knowledge and I think that’s a great thing. What are some of your favorite pieces to play on this tour? B: There’s this song we do called 'Take Me to Harlan' which we wrote together off of an idea that Abby had which was that, she wanted to be able to sing and clog dance at the same time. So she started singing syllables and she kept singing the word Harlan while she was buck dancing upstairs in her office while I was sitting there trying to figure out what chords went with it. And we ended up with this kind of really neat [song]. It’s kind of got some funkiness to it, some earthiness to it, and some great dancing and it’s a real song. And it knocks people out. In fact we first put it on stage and we realized we had to end the show with it because there was nothing that could follow it. It’s a great visual and it’s a very catchy tune and I really enjoyed playing that with Abby. Abigail, you performed that on NPR Tiny Desk last year clogging while singing while you were pregnant. Was that the last time you did that, during your pregnancy? A: Oh! I danced the day we gave birth. In fact, it was one of the ways I got the baby out beause I had to be induced because we didn’t have enough amniotic fluid in there once we were at the due date. And so they set me over to the hospital and Bela brought his banjo ukulele and I brought my clogging shoes and we just sat in the lobby and I danced for about an hour and that’s when the first contraction hit. Abigail, when you’re not clogging, what’s some of your other favorites? A: I also really like playing a set of fiddle tunes with Bela. Because we get to really dig in. There’s three tunes. One is called 'Sally in the Garden' that I learned form a West Virginia banjo player. Then one is called 'Big Country' that Bela wrote. Then the last one is called ‘Molly Put the Kettle On’. When we get to play together, it’s two banjos, three-finger and clawhammer. It’s like, we’re both playing in our element completely, but we have to figure out how to line up our two different styles of banjo playing. And it’s just been a real journey to get to where we are at this point. Trying to figure out who is pulling back, who is pushing forward rhythmically? Where our center is. What we want the feel of the tunes to feel like. I just enjoy it every time we play it very much. That’s an interesting point. Because you are adjusting to each of your different styles, are you learning something new about each other every time you play on stage? B: I would say that when we first started doing that there was some curiosity among people including use whether this could work musically even. And then as we got in to it we went, ‘Oh yeah this can definitively work.’ And then we started getting better at it and then the years started going by to where it just was totally normal to be playing in this two-banjo group. But the process of improving it had to do with learning how we felt things differently. And as a bluegrass player, we chase the front of the beat. We are beat hounds. And we are on the front edge and we like to go over the edge and push. And things get faster and they’re aggressive. And in old-time music it sits in the middle or even is on the backend. Things are very relaxed. Not all the time. It’s not always super bluegrass or old time. But generally speaking, it’s more of a grooving kind of vibe in old-time music. So for Abby to get used to kind of pushing with me when I wanted it to push. And for me to get used to letting it relax and that being positive, was a big learning experience for us. When you travel through Buffalo, is there anything you look forward to outside of playing? B: Yeah and I think for me, my experience of Buffalo for many many years was going to the college where the Flecktones were going to play and just being back stage at the college and getting to do my laundry. And I always looked forward to this great industrial washing machine that they had at the college. B: I knew I was going to be able to get in there and to do my laundry. A lot of times when you tour you don’t see anything much besides the backstage and the bus. But then I got to play with the BPO and do my banjo concerto there, and that was cool because I was there for extra days at rehearsal and I got to experience more of Buffalo then. Then I came and played this place we’re playing now with the banjo tour. We were downtown at the Hampton Inn and there was a big coffee shop across the street. I always sort of love the coffee shops. You know, that’s life on the road. Moving forward, what do you want to do in the future? B: I think we’re always kind of concerned with balance in our lives. That’s because it’s hard to balance this kind of life. When we’re doing too many things apart we need to do more stuff together, and when we’re only playing together we need to find things to do apart once in a while. So I think it’s all about just finding balance as we go along, but I don’t see why we wouldn’t be performing quite a bit for the rest of our lives. A: I think we talk about lots of fun ideas. We’re getting together with the dance troupe ‘Pilobolus’ this summer to see what we can do as a duo with them. And then we’ve also thought about doing a larger project with lots of banjos like a banjo orchestra. B: Yeah that’s a fun one. A: And I think we’ll always be thinking about the fact that we can make another record together as a duo. So that’s definitively sitting out there as a potential thing. But I think we both feel sort of a curve in our musical creation relationship where we’re looking to do something a little different in this next project whatever we do. B: Yeah I think we’ve kind of established that the two-banjo format can work and we’ve done quite a bit with it with these two albums and live. So now we’re sort of wondering what kind of fun things we can do with some other people too. I think the neat thing about folk music is you can have a long career in it and you can continue to be part of these festivals and these concerts and coffee houses and theaters and have a presence in that world for your life and I think that’s something that we want to do together. This past weekend, the Kavinoky Theatre started its run of George Orwell’s "1984" after less than three weeks of production. Producers were forced to make the last-minute switch after they were told their planned production of "To Kill a Mockingbird" could not be staged because of a legal dispute. Stories on television and at the movies that include people with disabilities are becoming more prevalent. But recent studies have found that while the disabled account for nearly 20% of the U.S. population, roughly 2% of characters portrayed on television and in major U.S. films are disabled. The studies also found that the majority of those roles are still going to able-bodied actors. As part of his series on the arts and social integration, Arts & Culture Desk reporter Scott Sackett visited with a playwright and theater director who, on the local scene, is giving disabled artists an audience and changing the public’s perceptions of disabled people.